It is pretty uncomfortable – not to mention embarrassing – to wear a t-shirt or jersey or hoodie that is just too small or too short. I noticed that Majestic Athletic had a lot of clothing items designed for those of us who are bigger and /or taller than the typical Yankee fan. Looks like the sizes go up to size 60. I remember a time when unless you wanted a jersey or shirt of the biggest stars on the team, you would be out of luck, like when you could only find a Don Mattingly baseball jersey or a Wade Boggs t-shirt instead of, say, a John Wetteland t-shirt or a Charlie Hayes jersey. Nowadays, you can find clothing, especially baseball jerseys, to support pretty much every Yankee you can think of, and Majestic Athletic offers all of it. Think that Bird is the word? Get a Greg Bird shirt. Support Didi Gregorius? His jersey is available. Cult fan of Andrew Warren? Show your support here. Of course, the big names are here as well. Mark Teixeira. CC Sabathia. Alex Rodriguez. Jacoby Ellsbury. Brian McCann. Even Joe Girardi! It is good that baseball clothing manufacturers have finally started making items for women. But not everybody is a fan of wearing pink Yankee gear. Some of us want clothing that is tailored to our bodies, but is still in pinstripes or Yankee blue. Majestic Athletic has items for femaleYankee fans that look just as cool as what the big boys are wearing, but are sized to fit women. In addition, you can get personalized baseball jerseys and shirts. In closing, I’m going to have to add Majestic Athletic to my shopping repertoire. Sunday night was the first supermoon eclipse since 1982. It only felt like it was that long since the Mets had meaningful games in October. Finally, the Mets are back in the poststeason! The Mets won their first World Series the year of the first moon landing. The Mets won their second World Series the last time Halley's Comet was in the vicinity of Earth. Could the stars align a third time in the year of the supermoon eclipse? With the Mets' starting pitching, anything is possible, especially now that Matt Harvey appears to have rediscovered his willingness to put the team first, which is great news. As much as I enjoy seeing celestial events light up the evening sky, the event I really enjoyed seeing was 97 pitches of a Dark Knight. Of course, what I enjoyed seeing most of all was the extensive coverage of the postgame celebration on SNY. A year and a half ago, Daniel Murphy received some foolish sniping over his taking three days of paternity leave. After the game, Murphy celebrated on the field with his young son. The Mets even came back on the field to celebrate with Met fans who had made the trip to Cincinnati. Inside the clubhouse, some Mets smoked celebratory cigars. When SNY finally cut to a commercial, it was fortunately not one of those grisly anti-smoking spots. The Mets trailed the Nationals by three games at the trade deadline just two months ago. Then the Mets capped off their midseason moves by trading for Yoenis Cespedes. The Nationals had recently completed their own move, supposedly bolstering their bullpen with the acquisition of Jonathan Papelbon. Five years ago, Mets' star closer Francisco Rodriguez allegedly assaulted his girlfriend's father at the ballpark. 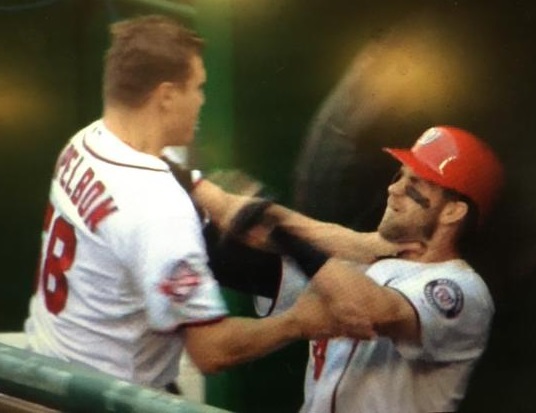 Sunday, Nationals' star closer Jonathan Papelbon tried to attack teammate Bryce Harper in the Nationals' dugout. Harper is only the front-runner for NL MVP. Maybe it's just a coincidence that the Nationals' collapse began when they acquired Papelbon, but considering that the move also sent demoted closer Drew Storen into a tailspin culminating with Storen breaking his thumb in frustration. At least Storen did so while slamming a locker door, not trying to slam a teammate. Another parallel with the Mets and Nationals is that the Nationals had their own issue with innings limits for a pitcher coming back from Tommy John surgery who was represented by Scott Boras. In 2012, the 98-win Nationals shut down Stephen Strasburg in September, only to lose in the first round the following month. When the Mets face the Dodgers in the NLDS, they will continue to have Harvey's services. But the Nationals figure to come back strong next year, especially if they have better luck with injuries and get a new manager and closer. So congratulations to the Mets for seizing their opportunity this year and capturing the NL East crown. Ya gotta believe! 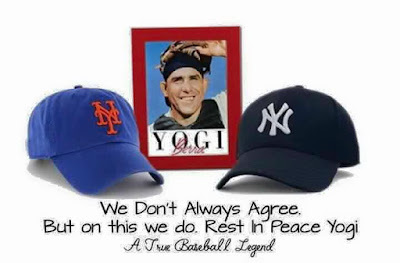 In my formative years as a baseball fan, Yogi Berra was a Met. After the Yankees fired him as manager in 1964 after losing Game 7 of the World Series, Berra coached or managed the Mets from 1965-1975. Berra was the first base coach for the 1969 Miracle Mets. When beloved manager Gil Hodges died suddenly at the end of spring training in 1972, Yogi took over as manager. In 1973, Yogi led the "Ya Gotta Believe" Mets to the World Series. One of the most famous Yogi-isms came during that 1973 season, The Mets were nine games under .500 as late as the end of August, but their manager proclaimed, "it ain't over till it's over." Yogi's Mets came back to win the NL East, upset the Reds in the NLCS, and take Oakland's early-1970s dynasty to Game 7 before their season finally was over. 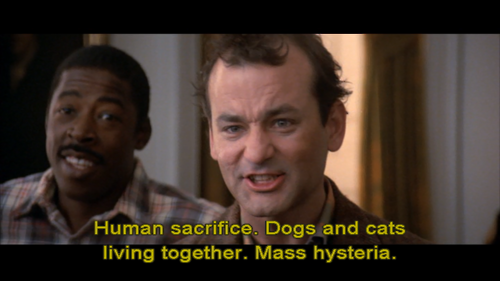 Many Met fans were muttering this the last few days as the Mets appeared in danger of another late-season collapse. But after Thursday's Met win and Washington loss, the magic number is 3, and the deja vu is going to refer that champagne celebration from 2006 SNY has been rerunning. Sandy Alderson traded Wilmer Flores and Zack Wheeler for Carlos Gomez, then took back the trade, acquiring instead some guy named Cespedes. Gomez, meanwhile, is hitting .234 for Houston and has not played since September 12 due to an injured back. Daniel Murphy running the bases. What happens after you invest with Bernie Madoff. Matt Harvey has every right to prioritize his future health and earning potential. But he can't negotiate a departure after 77 pitches of one-hit ball and claim that all he wants to do is pitch. "More than anything, I wanted to be out there," Harvey said. "The way things were going, the tight game, the last thing I wanted to do was come out." 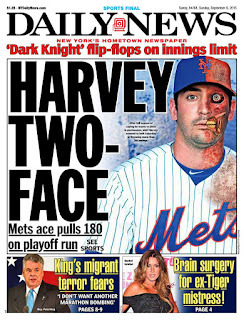 It may seem unfair to hold Harvey responsible for last night's 11-2 loss when he was the only Met who did his job well. If the bullpen and the defense had done their jobs, today's headlines might proclaim that the Boras/Harvey part-time pitcher plan had passed its first test. But this plan required four innings from a Mets bullpen that has trouble handling more than two innings, and that's when Tyler Clippard is not missing time with back problems. This is the time when the starting pitcher is supposed to figuratively put the team on his back. "For me, I know where I want to be and that's on the mound and in a Mets uniform." "The last thing I want to do is not play and not pitch, especially if we get into the postseason." For not accepting responsibility, for putting his manager and teammates in the unenviable position of having to live within the limits that Harvey and Boras put in motion, and for saying he wants to be out there when he engineered the exact opposite situation, Harvey should be nominated for an Emmy for Best Actor in a Comedy Series. Only no one in the Mets clubhouse is laughing. Yoenis Cespedes offered to play centerfield when he came to the Mets, even though that was not his regular position. He's stopped hitting since he was hit by a pitch last Tuesday but refuses to use that as an excuse. Cespedes may end up getting some votes for National League MVP despite only joining the Mets in August. Harvey's been around all year and has had a pretty good year. But nobody is using "Harvey" and "MVP" in the same sentence. Harvey showed last night that he can produce after a long layoff. Going forward, the Mets should just shut him down until the playoffs (or until the season-ending series with the Nats if the Mets have not yet cliinched), then only use him in games in which he announces beforehand that he wants to pitch as much as he can. Superhero movies are box-office gold these days. But nobody wants to see "The Dark Knight Takes Himself Out of the Game." I am still peeved that Squawker Jon and I were unable to get Subway Series tickets this time around, but at least we got to watch most of Game 2 together. We also made it a mini-Daily News reunion, as we met with our old web room friend and cohort Ethan Sacks at Henry's on the Upper West Side to watch the game. We have known each other for ages, but it has been a while since I had seen Ethan -- too long! So it was great to catch up with him yesterday. Ethan is a fellow Yankee fan, but *not* an A-Rod fan! Fortunately, there were no fisticuffs at our reunion. of the DN staffers laid off this week. It took my express bus forever to get to Manhattan, though, so I missed seeing Carlos Beltran's 1st inning homer, although I did listen to it via the MLB At-Bat app. 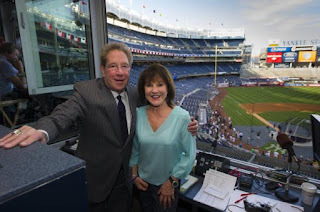 (Note: I listened to Mets broadcasters Howie Rose and Josh Lewin, as opposed to John Sterling and Suzyn Waldman. You know, because I actually wanted to know what was happening in the game!) We did see when Michael Pineda was taken out, and wonder why Joe Girardi was doing his usual overmanaging. I read in today's New York Post the latest bloviating from Yankees GM Brian (Fredo) Cashman. Cash, who thinks he's a badass because he rides a bicycle without a helmet (I think that makes him a moron, but I digress), “If we are world champions, I don’t care how we got there," he tells George King, sounding like he is conceding the AL East. Um, Bri, maybe it's too much bike riding without a helmet, but you do understand that the Wild Card no longer automatically entitles teams to postseason ALDS series bids, and that the Yanks will have to win a one-game playoff in order to advance? So your cockiness is moronic. Oh, and I posted a photo of myself on Facebook yesterday holding a mimosa and toasting the Yankees' victory in the Subway Series. Unfortunately, I made a typo and spelled "Series" as "Seties." Not good for the professional proofreader! I blame my bad typing on my iPhone, but others are blaming it on the al-al-al-al-alcohol. Two of the members of my running club's fantasy football league mocked me for this typo. Josh had this to say -- make that, to snark! : "'Seties?!' Must we correct the Proofreader?! Just say no to drinking and posting." Squawker Jon was getting on me today for being tardy in my writing. Dude is like Robert DeNiro in "Awakenings" -- after years of slumbering, he is all of a sudden Squawking up a storm. Today he made Matt Harvey babying jokes. And Jon was nagging me to finish my Squawk early this afternoon. Look, I ran 10 miles (!) this morning. I am in training for the Staten Island Half-Marathon, which is happening in three weeks. And this is the first time I have ever run past nine miles, other than in my previous half-marathon. So I was exhausted, and just wanted to relax when I got home. Jon's big journey today was going to Zabar's to get a bagel! I did make a point of picking up the Sunday New York Daily News today. I was hoping that they would allow Bill Madden, Filip Bondy, David Hinckley, et al to say farewell to their readers. After all, each of them has been at the paper for at least three decades before being laid off. And as much as Madden drove me nuts with his anti-A-Rod crusade, I still read his baseball column every Sunday. Unfortunately, after nearly forty years at the News, they didn't even give him the courtesy of letting him write a farewell column to his readers. The closest the News gave to a Madden tribute is letting Mike Lupica, who is still on the payroll, write about him today. My eyes rolled so hard over that, they're in the back of my head now! The newspaper business is a really cruel one. Sunday night will be the latest regular-season Mets-Yankee matchup ever, but Matt Harvey will be treated as if it's spring training. Various reports having him getting pulled after 70 pitches or six innings. Or perhaps he will be pulled if he and Scott Boras get colicky again. Boras will doubtless want to monitor Harvey closely tonight, and it just so happens that Amazon's Deal of the Day is the iBaby Monitor M6 HD Wi-Fi Wireless Digital Baby Camera. At $139.95 down from $199.95, the Mets could even spring for the device as a peace offering toward Harvey's helicopter agent. After all, the promotional copy promises: "no more endless phone calls from the office to check on your little bundle of joy." As for Game 2, not much good to say about the 5-0 Met loss. Yoenis Cespedes is 0 for his last 17, but his overall Met numbers remain sensational. What's more concerning, however, is that the Mets have been shut out twice and have scored only eight runs total in their last four games while Cespedes has gone cold. The Mets now have enough good hitters that others should be able to pick up the slack when Cespedes inevitably cools off. Lucas Duda hit nine homers in eight games in late July and early August, then failed to hit another one until Friday night. Yet it was when Duda stopped producing that the Mets' offense took off. Can the Mets now similarly thrive without Cespedes' daily heroics, or is it that, as Cespedes goes, so goes the team? If it's the latter, Cespedes' free-agent price just got higher. 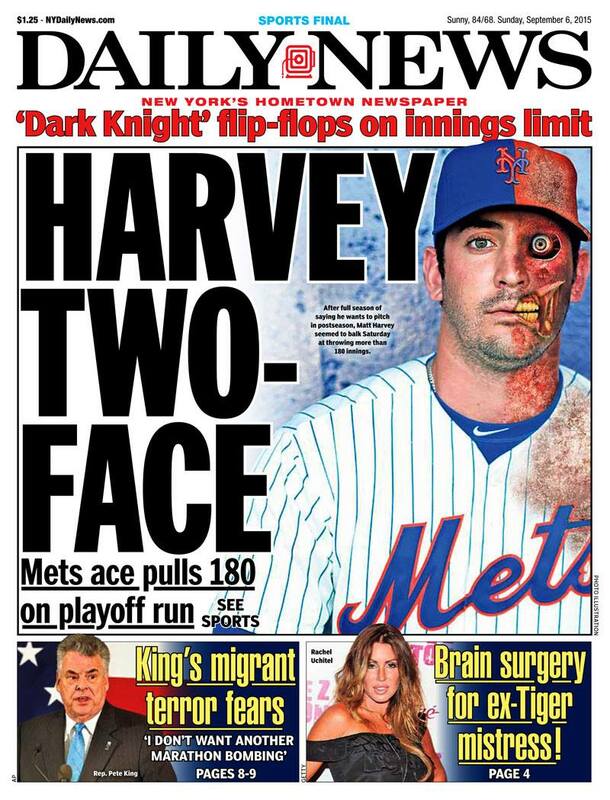 If Harvey does well tonight against the Yankees and shows he is in good form for the postseason, much will be forgiven. It shouldn't be too much to ask, considering that he is going on ten days rest. As Squawker Lisa would say, sounds like my blogging schedule! For a while now, I have wanted the New York Mets to be a winning team again. "It's good for the Squawkers," I would implore, when fellow Yankee fans would roll their eyes at this idea. Alright, Mr. DeMille. I'm ready for my closeup, is what I say! You see, I am ready to get this blog to the next level. If the Yankees and Mets are both playing in October, it can mean big exposure for us. I want us (or at least me, if introvert Max, um, I mean Squawker Jon, balks) to be on New York sports radio, and TV. I want fame and fortune. Is that so wrong? Anyway, now we have a situation where the Mets have gotten good; maybe a little too good. They are going to win the NL East. No 2007-esque collapse is in sight. (The Nationals are the ones who choked away the division, not the Mets!) Meanwhile, the Yankees have lost their hold on the AL East, and are, unless they go on a roll, destined to make the Wild Card. (It remains to be seen, though, who their opponent will be. although it looks like it will be Houston.) So Mets fans are starting to chirp in response to my squawking. The cacophony is alarming! I really wanted to be at last night's game, but even standing room only tickets were over $50 each. So I sat down and watched the game at home. And Citi Field was rocking last night. Mike Vaccaro, the great New York Post columnist, calls Friday's game Opening Night for Citi Field, in that it was the first real game since opening in 2009 where the house was rocking the way Shea Stadium used to be. I agree. Last night's game was good -- if you are a Mets fan. For a Yankee fan like me, we got treated to some truly boneheaded moves from Joe Girardi, from benching Brian McCann to not pinch-hitting for Brendan Ryan with A-Rod to Girardi's bullpen wackiness. He threw in the towel right from the beginning, and it was not fun to watch. Given that Tanaka was on the mound, Joe should have actually, you know, tried to win the game. He didn't. Oy. I also am going to have to hear sass from the now-vocal Mets fans I know. Good grief. My friend Sully compares Mets fans these days to Robert De Niro in "Awakenings." Heh. But at least we'll always have Luis Castillo to torture Mets fans with. "Dropped the ball! He dropped the ball! Here comes Teixeira. And the Yankees win! Oh, my goodness. He dropped the ball!" refrigerator door. This saying is one of them. Warning: Squawker Jon may call this "navel gazing," as he sometimes does when I write anything personal. I will also talk about 9/11, A-Rod, the New York Daily News, running and death. Be forewarned! A few things over the past week reminded me how, in the words of the Grateful Dead's "Box of Rain," what a "short time to be there" we have, and how we really need to make the most of our time on earth to be happy, and be who we should have been in the first place. The anniversary of 9/11 is one of those reminders. I used to whine about how old I was getting each year, until the Twin Towers were destroyed. What made me stop complaining about my age was looking at the names and birthdates of the people honored at Staten Island's 9/11 Postcards memorial. They never got the opportunity to grow old with their families. Growing older means that we're still alive, after all. I was on my pal Paul Francis Sullivan's Sully Baseball show again recently, talking about the state of the Yankees. A-Rod's continued success this year, both professionally and reputationally, spurred me to wax philosophical. My point was that Alex has proven that as long as you're breathing, you have the chance to rewrite your life and come up with a better ending. Sully and I also agreed, though, that there are exceptions to this rule, of course. Because they are predators, Bill Cosby and Subway spokesman Jared Fogle are not going to be able to rehabilitate themselves! But in general, the point holds. If A-Rod had retired, the way Bill Madden wanted him to do, he never would have gotten the chance to rewrite his story. But Alex didn't, and now he has a much better reputation than he did a year ago. Over the past two years, and especially over the past year, I have really tried to change my life in many ways. While I am still a work in progress, I have lost 55 pounds so far, and will be running my second half-marathon next month. Plus, I actually have a real writing career now! Because of my being so candid about my struggles, others have talked to me about their own issues. If you look at Facebook posts, you'd think most people are happy, but they're not. There really is an epidemic of unhappiness in this country. And you can trace so many problems and addictions that people have to this. I know part of the reason I overate was because of being unhappy with my lot in life. And it was also easier to eat than to fix the things wrong with life then. However, we all need hope that things will be better in the future, even if that may be a long way away. And even if others around us want to continue to keep us down. Whether you have faith in a higher power or not, we weren't put on this earth to be miserable, or to stay miserable. Especially given that we are privileged to live in the United States. This country was built on the principle of the pursuit of happiness; it's written in the Declaration of Independence, after all! Yet we sometimes think we don't deserve happiness, as if there is nobility in misery. There isn't. Changing your life is extraordinarily hard, though. I know that from personal experience. It has taken a long time to lose those 55 pounds, and I still have a ways to go. But, as my running coach Mario says about me, I have the consistent persistence to keep on going. I think this comes from the desperation I felt in wanting to change my life, plus the success I have had with small victories has kept me going. I still wonder, though, how I had the courage to join a running club when I weighed 252 pounds! Unfortunately, in many cases, some of our "loved ones" don't really want to see us make positive changes. They would prefer us to stay miserable. One of the things friends who had lost weight told me to watch out for was that I would see that some of my loved ones would not be supportive of my fitness journey, and would prefer for me to stay fat and unhappy. Sad but true. If I could give one word of advice, though, it would be that there is no time like the present to change your life. Especially for people in my age range, where we start seeing our peers dying suddenly. If I were to die tomorrow, I would want two things to be done at my funeral. First, I'd like to be eulogized as having tried to make my life better by getting off the couch. The second is to have "The Eyes of Texas," the school song for the University of Texas, played and sung at the service, and for everybody to do the Hook 'em Horns signs like at Lady Bird Johnson's funeral. But I digress. I am a big believer these days in positive slogans and books, which would surprise my old Daily News colleagues who saw me as a cynical person in that cynical environment. I even have a slew of inspirational magnets on my refrigerator. 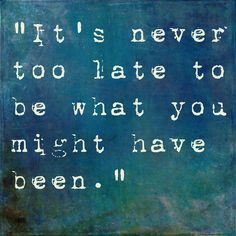 One says that it is never too late to be what you might have been. I truly believe that. I also live by Eminem's lyrics in "Not Afraid," where he says: "I'm a be what I set out to be, without a doubt undoubtedly." Not the best grammar, but I agree with the sentiment! For better or worse, the New York Daily News was a huge part of my life from an early age. I grew up reading the paper every day, starting from 1977, when I was 10 years old. Between the New York Yankees' "Bronx Zoo"-era coverage, and the Son of Sam stories, the paper was an enormous influence on my way of thinking. Then, when I ended up working at the tabloid in 2000, being at the paper -- and the friends I made there -- helped turn me from a rube (my idea of fine dining then was Red Lobster!) into a real New Yorker. Plus, I met Squawker Jon (he hired me and got me out of Texas) and other people who are friends to this day. Way back in 2006, Jon suggested that we start something called a "blog" together, where he would argue for the Mets, and I would for the Yankees. Without the Daily News, there would be no Subway Squawkers! I had always wanted to be a writer, but my only outlet then was writing about the Yankees on various local message boards. If it weren't for Jon suggesting that we create the blog, I would be nowhere in my writing career. It has been almost seven years since I worked at the Daily News, but I still have old friends and old colleagues there, and I still read at least parts of the paper fairly regularly. And while I expected that there would be layoffs after it was announced that owner Mort Zuckerman was unable to find a buyer for the paper, even I was stunned to see how many good people are now losing their jobs this week. With the news of the job losses, I also had flashbacks to when I got laid off, and how devastated (yet relieved) I felt at the time. My last few months at the paper (with a boss who despised me, and who I despised) were like being stuck in an abusive relationship (he even stole stuff from me! ), and it reminded me how miserable I was then. Fortunately, my life is much better now, although it took a long time to get there. I also can see now that losing my job there was ultimately a net positive, as it set me on a different career trajectory. Because I worked nights them, I really didn't know anybody in New York City. Losing my job forced me to meet new people and network and get out there, instead of thinking that life was all about West 33rd Street. A word to the wise -- if you know someone who has suffered a job loss, whether at the DN or elsewhere, please don't tell them nonsense like "everything happens for a reason" or "you'll be better off in no time." That is not realistic. And everything doesn't happen for a reason, unless you think there is some cosmic value to, say, children getting cancer. I can tell people from personal experience that I went through rough times after my Daily News job loss, ultimately became a stronger person through such a trial by fire, and am much happier now. But it certainly didn't happen overnight. As the Ringo Starr song said, "It Don't Come Easy." Nothing worth having does. And the single best thing you can do, other than listening to your friend's concerns after a job loss, is to give them a lead for a new job. I reached out to some contacts tonight on behalf of a few of my old friends. I hope this will help them get back on their feet soon. I was a little sad to hear that lead A-Rod basher Bill Madden and sports editor and investigative team leader Teri Thompson lost their jobs, even though part of me finds it amusing that during this time, A-Rod is riding so high! I grew up reading Madden and still have several of his books on my shelves, before he went so wacky against A-Rod. Thompson may not have been nice to A-Rod, but she was always nice to me personally. On the other hand, I have nothing but schadenfreude about Mike Lupica. Heaven help the web editor who didn't turn off the comments section on his articles. (He refused to allow anybody to comment on his work!) Here's a comment: What a tool! I just heard that entertainment columnist David Hinckley was one of the casualties of the New York Daily News' Firemageddon. I am not ashamed to admit that this news literally made me have to leave my desk so I could go have a good cry. There have been a lot of bad losses to the paper over the past day, but this is the worst. Nobody wrote as much as Hinckley did for the Daily News, or as well. He was able to write quickly and intelligently on any entertainment topic you could think of. Hinckley was my very favorite writer at the paper. And it wasn’t just due to his writing; it was due to what a generous, kind person he was. He was a true team player in a very cynical industry. In my last 18 months at the paper as a web editor, I was tasked with getting original online-only entertainment content for the site. However, I had no budget. Instead, I was expected to use my powers of persuasion to get the paper’s already overworked entertainment writers to create content for the web for no additional compensation. Needless to say, this wasn’t an easy thing to get done. But not with Hinckley. He never turned down a request, even if it meant him writing at home for free on his own time. Sometimes, if there was a breaking entertainment story, like when Heath Ledger died, Hinckley would even offer on his own to do a web-only piece, like when he put Ledger’s death in context with other actors under 30. Squawker Jon and I used to joke that if a real Armageddon came, they could put out an entire paper just with Hinckley’s writing. He was that prolific – and that good. I guess the paper’s plan is to replace the older writers they fired with younger, cheaper people, the way they did with the web site. But in my opinion, they may as well just shut the paper down now. Without Hinckley, and the many sports layoff casualties, they have gotten rid of pretty much every single interesting voice at the Daily News. This makes me very sad. My thoughts on Matt Harvey, who is not just a writer but New York City Bureau Chief! Daily News for another great cover! Happy Labor Day! We do have something to celebrate that wasn't in existence last year. And that would be The Players' Tribune, Derek Jeter's sports website. As my friend Dean points out, "Players Tribune has been a boon to ghost writers and PR flacks alike. On Labor Day we should celebrate this new entity that creates work for background scribes." How true! And you know, I still don't understand the business model for this site. How does it make money, since there is no advertising on it? Do the players pay for the access to it? Is Matt Harvey paying $$$ to get his "New York City Bureau Chief" title at The Players' Tribune? As I have said before in this space, I never say "we" when I talk about the Yankees, as I ain't playing. But pretending to be a "bureau chief" for this publication when all Harvey does has been to have all of three ghostwritten stories published on the website is ridiculous. That would be like me calling myself a "right fielder" because I got stuck in that position in fifth grade gym class! Is Harvey assigning stories, managing journalists, and taking out a red pencil to copy edit pieces? No? Then how is he a bureau chief? Maybe I should start calling myself the New York City Bureau Chief for Subway Squawkers! (Sorry, Jon -- I am stealing this title for me!) And speaking of Jon, he wrote a very funny column today about Matt Harvey -- click here to read it. Harvey only has Harvey to blame for this debacle. Maybe they ought to trade him to, oh I don't know, the Yankees or something. Seems fair to me! The Matt Harvey Rules: Innings limits for everybody! On advice of my agent, er, my doctor, I am instituting an innings limit. As any Met fan knows, watching this team can be very stressful, so I can't make any commitment beyond Tuesday's game. Squawker Lisa, I know what you're thinking: I blog so little, what's the difference? And shouldn't I be excited about the chance to watch meaningful games in September for the first time since 2008, not to mention the good chance of playoff baseball? But my agent, er, my doctor, reminds me of what happened when the Mets last had division leads in September - in 2007 and 2008. Tom Glavine, a future Hall of Famer, gives up seven runs in 1/3 of an inning in the final game of 2007 to eliminate the Mets. It took months of grueling rehab for me to overcome that debacle. What if future Hall of Famer (just ask him) Matt Harvey spits the bit in a similar situation this year? Then there's 2006, the last time the Mets made the playoffs. Future Yankee Carlos Beltran with the bat on his shoulder. Do I really need to see probable future Yankee Harvey merely an observer as another Mets October dream dies? As great as the 2006 Mets team was, their starting pitching was decimated by the time they reached the NLCS, forcing them to turn to lefty Oliver Perez in the pivotal Game 7. Perez actually did pretty well that game, but with team as stacked with starters as the 2015 Mets, it would be a shame not to have one of the studs not on the mound should the Mets get to the postseason and face another Game 7. I told my agent, er, my doctor, my nightmare - that all of the Mets' young pitching stars would be capped by innings limits, forcing them to turn to another fringe lefty for Game 7 - Eric O'Flaherty. As a compromise, the Mets have suggested that I skip any innings that feature O'Flaherty. But my agent, er, my doctor, points out that innings featuring or anyone in the bullpen not named Familia or Clippard (and Clippard didn't do so well yesterday) usually result in unhealthy agita. One day, science will find a cure for unreliable setup men. But until then, an innings limit for me is the prudent course. Update: In a post for The Bloggers' Tribune, Squawker Jon announced that if and when the Mets make the playoffs, of course he will be watching. His fear of being traded to a small-market fanbase has nothing to do with his decision.